The ARM® Cortex®-M0+ Debug Acess Port (DAP) enables communication between the core and the device pins during debug. The Data Watchpoint Unit (DWT) is a debug unit that provides up to 2 watchpoints for data tracing and system profiling (CPU statistics, PC sampler). 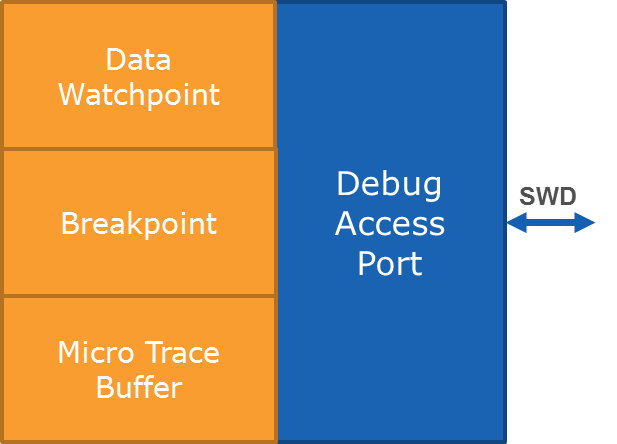 The Micro Trace Buffer (MTB) provides a simple instruction trace. It uses a small portion of SRAM for the trace buffer. The Serial Wire Debug (SWD) port consists of three pins. Unlike the other SAM micros, the SAM D, SAM L, and SAM C micros (Cortex-M0+ based) do not implement the JTAG interface. It is SWD only.